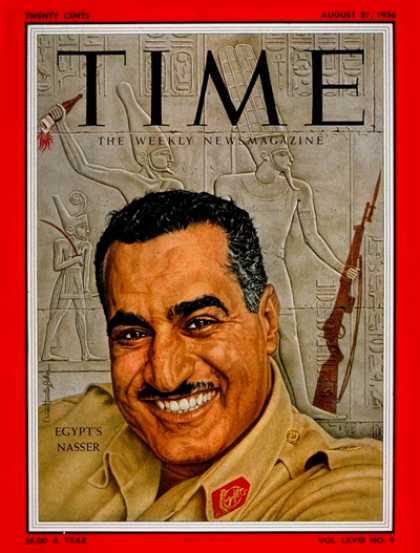 Nasser was killed by Sadat ? DAMASCUS – Forty years after his death at the age of 52, president Gamal Abdul Nasser of Egypt still raises plenty of controversy throughout the Arab and Muslim world. There are many theories regarding Nasser’s untimely death in 1970, ranging from heart failure to poisoning at the hands of his Russian masseuse. Nasser was famously wrapping up an Arab summit aimed at ending war in Jordan between King Hussein and Yasser Arafat’s Palestinian Liberation Organization. After seeing off his Kuwaiti guest, Prince Sabah Salem al-Sabah, the Egyptian leader collapsed and was proclaimed dead on September 28, 1970. Today, 40 years down the road, Nasser’s trusted aide, the journalist Mohammad Hasanein Haikal, has created uproar in Egypt by implying that Nasser’s deputy and successor, Anwar Sadat, poisoned the Egyptian leader. Sadat was the third president of Egypt, serving from October 1970 until his assassination by fundamentalists on October 6, 1981. Speaking on his program on the Doha-based al-Jazeera on September 16, Haikal said that both he and Sadat were present at a meeting at the Hilton Hotel in Cairo between Nasser and Arafat. Sadat noticed that Nasser was very tired, offering to make him a cup of coffee. He asked Nasser’s private cook to leave the kitchen, prepared the coffee, which Nasser drank – and died three days later. The story ripped through Egypt and the Arab world like thunder, eliciting an immediate response from Sadat’s family, which sued Haikal for reputation slander. A few years back, Nasser’s daughter accused Sadat of killing her father and was fined 150,000 Egyptian pounds (US$25,120) by a Cairo court for slandering Sadat’s reputation. Her brother Abdul Hakim Nasser called on Egyptian authorities to investigate Haikal’s claim, adding that one of Nasser’s aids, who later served under Sadat, had concealed nail clippings of the late president and snippets of his hair, to prevent a laboratory investigation on the causes of death. Nasser’s physician, al-Sawy Habib, ended his own 40 years of silence by penning an article for the mass-circulation daily al-Ahram, saying that Nasser suffered from myocardial infarction (the interruption of blood supply to the heart), hypercholesterolemia (high levels of cholesterol) and high blood pressure. Many members of Nasser’s family, including his mother, brothers, sisters and uncles, had died in their 50s, he added. Haikal’s story, however, raises plenty of questions, for a variety of reasons. One is Haikal’s age, currently at 87, along with the fact that Haikal is known for weaving tales impossible to verify, filled with nothing but dead witnesses. One question that comes to mind is why Haikal has waited 40 years to come out with such a bold statement. Why didn’t he do it when emotions were high against Sadat, during his 1977 visit to Jerusalem or after the signing of the Camp David Accords? Why didn’t he do it when Sadat fired him from his job at al-Ahram in February, 1974? Another fact that raises doubt over Haikal’s argument is the status of Sadat in September 1970. He was a senior member of the Egyptian government, an ex-speaker of parliament serving as vice president. It is doubtful that he would offer to make Nasser’s coffee himself. And even if he wanted to kill his long-time friend and mentor, he would not have gotten his own hands dirty with such a crime, preferring to do it through a third party. Additionally, Nasser – unlike Arafat – was very careful when it came to his security after having suffered an assassination attempt in Alexandria in 1954. The entire ordeal is a sad repetition of what was debated, behind closed doors, throughout the Arab world for most of the 20th century. It is a common argument for any leader who dies while in office without falling ill. When Syrian president Taj al-Din al-Hasani died at the age of 57 in 1943, rumors circulated in Damascus that he had been poisoned by his doctors. When the author of Syria’s first republican constitution, Fawzi al-Ghazzi, died of poisoning at the age of 38 in 1929, Syrian courts accused his wife of killing him to pursue a love affair with his nephew. Today, 81 years later, theories are emerging that he might have been poisoned by French intelligence. The same story emerged when Arafat died, also of unnatural causes – believed to be poisoning – in November 2004. The Haikal “bombshell”, as the Egyptian press is labeling it, opens the door wide for similar future arguments, blaming perhaps current Palestinian president Mahmoud Abbas of “poisoning” Arafat. When taking the Gaza Strip in 2007, Hamas claimed it found documents implicating one of Arafat’s aides, Mohammad Dahlan, ex-chief of preventive security, of having discussed “slaughtering” Arafat with then-Israeli prime minister Ariel Sharon. Even if these figures were indeed murdered, the sad truth is that we will never know who killed them because archiving in the Arab world is poor – to say the least – and those who knew what happened, with the notable exception of Haikal, have taken the truth with them to the grave. In Arafat’s case, for example, many Palestinians insist he was poisoned by Mossad. There is no way to verify that since last August, Israeli Prime Minister Benjamin Netanyahu signed off on prolonging the confidentiality of national archives related to events before, during and after the war of 1948. Anything related to the early years of the Zionist state and its relationship with the Arabs will therefore remain classified until 2018. Interestingly, the entire Nasser-Sadat ordeal resurfaces amid plenty of talk in the region about yet another political murder, that of Rafik al-Hariri, the ex-prime minister of Lebanon, in February 2005. Hariri’s fortunes, and the audacity of the George W Bush White House, apparently entitled him to a special international tribunal to hunt down his assassins, costing millions of dollars. This is a luxury that neither Nasser nor Arafat had. Just like we never really knew if Lee Harvey Oswald gunned down US president John F Kennedy on that fateful day in Dallas in November 1963, we might never know whether Nasser simply died young or was killed at the hands of one of his many opponents. Thanks, I’ve recently been looking for info about this topic for ages and yours is the best I have discovered so far.